I do believe in the world of flora and fauna timing is everything. 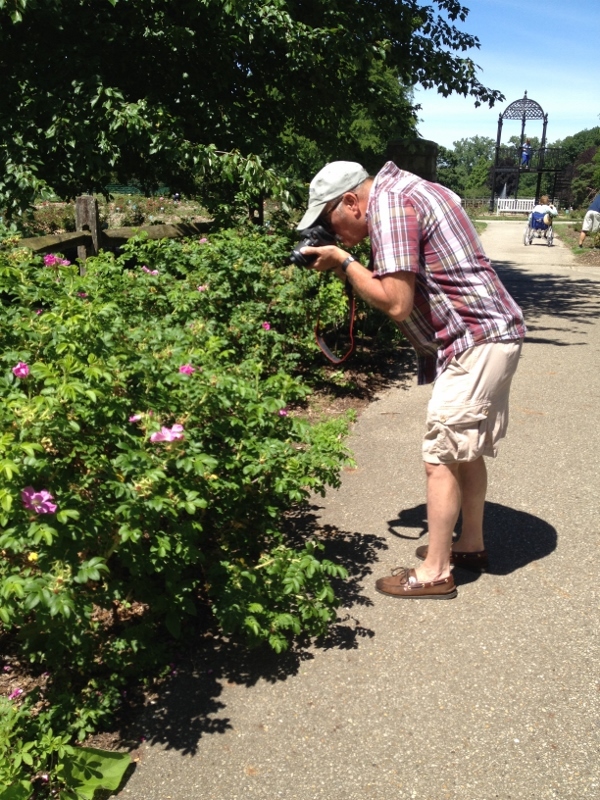 Last Sunday I had the pleasure to leisurely stroll through the rose gardens in Whetstone Park in Clintonville, OH, with dear Dave. Our timing was not the best as most of the blooms on the roses were a tad past their prime. Not that I am complaining; indeed, I am not. Strolling in a garden on a beautiful day and observing the other taking in the beauty of a lovely landscape is one of the great pleasures of leisure time. I spend most of my time planning, planting and observing my own garden. Relaxing in the bounty of another garden is just what the doctor ordered. The rose park, which is made up of three rose gardens within 13 acres, is a manageable size to maneuver if you are pressed for time (I had a flight to catch). But that’s not to say there wasn’t lots to watch. 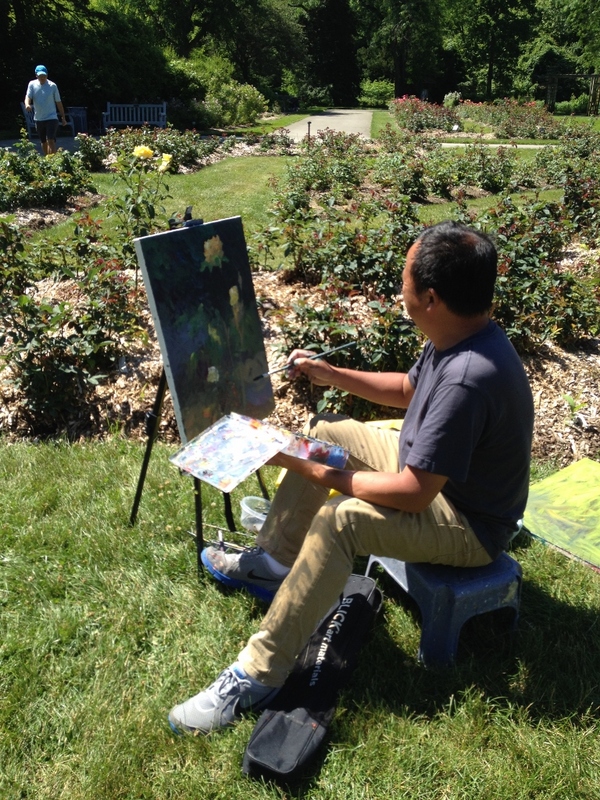 On Sunday–which was beautiful in Ohio–Dave and I lingered in the garden beds, watched families enjoying the day and spied on plein air painters as they captured a prize rose on canvas. No one seemed to mind that the park was not in full bloom. A plean air artist captures a yellow rose on canvas. 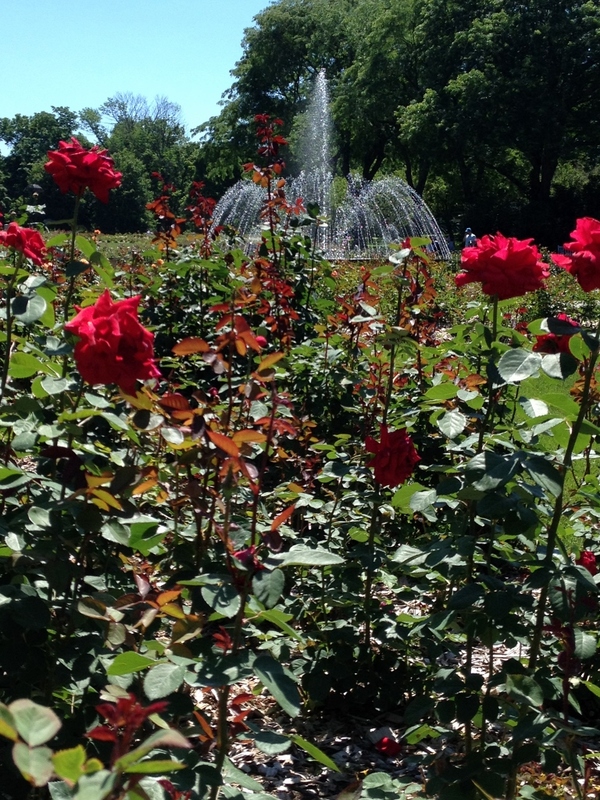 The Rose Park speaks to strollers, photographers, painters and garden lovers. An Earth-Kind Garden is one of the three rose gardens in the park. This demonstration garden features commercially available roses that a hassle free–they require no pesticides, zero fertilizers, zippo deadheading and no pruning. That’s a plant that speaks to me! Seriously, Earth-Kind gardening is about sustainability and using less water, less inputs and keeping mankind’s footprint a little lighter in the landscape. The program was developed at Texas A&M University and the park is the first one outside of the South to feature this informal rose style. 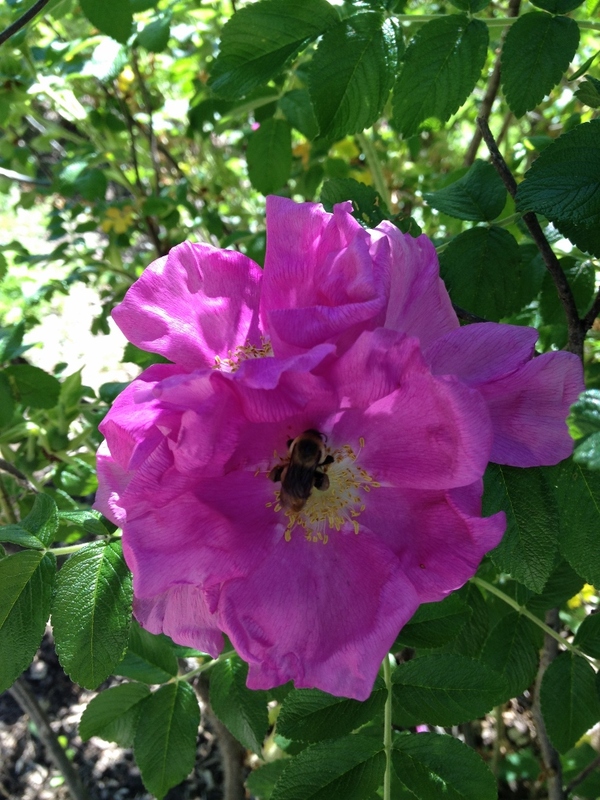 Though most of the roses had already bloomed but there were several varieties in the garden. Unfortunately, I did not capture any photos worth posting. Categories: Beyond Arch City, Uncategorized | Tags: Clintonville Ohio, Columbus Ohio, Columbus Rose Park, Whetstone Park | Permalink.